From a simple postcard so much is found. This is another find from the antique stores of Montana. So what is the connection to this postcard and the old photographs of Shades, you ask? Read on and all will be revealed. I had stopped at a small antique store in Missoula to look for old photographs when our California Daughter found hundreds of postcards written to the same person. She brought this one to me and I was completely taken with it and the entire collection. How could any family have let these treasures get away? I couldn't buy them all, but I did buy the best. 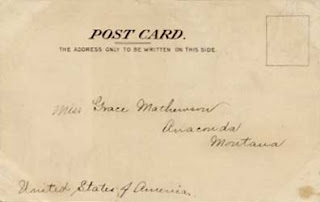 The postcard is addressed to Miss Grace Mathewson, Anaconda, Montana, United States of America. The cards were sent from all over the world and many were signed Mother or Daddy. The owner of the store thought that Grace's parents must have been diplomats. They weren’t, but that’s not the end of Grace’s story. I have been sick for two days. We are anchored now in the Straits. It is very dark and stormy out. The chairs are tied to the deck to keep them from being blown overboard. We will reach Punta Arenas tomorrow. This is our ship. Its first trip to coast. 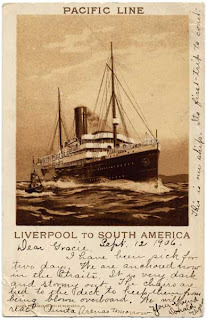 A close examination of the card indicates the name of the ship was the Orita of the Pacific Line - Liverpool to South America. The Orita was built by Harland and Wolff, Belfast for the Pacific Steam Navigation Company in 1903. A 9,266 gross ton ship, length 485.4ft x beam 58ft, one funnel, two masts, twin screw she had a speed of 14 knots. There were accommodations for 169-1st, 111-2nd and 528-3rd class passengers and she carried 172 crew. When the Orita was launched on 15th November 1902, she was the largest vessel on the Liverpool - West Coast of South America route. Her maiden voyage from Liverpool to Valparaiso started on 8 April 1903. Her final sailing via Montevideo was on 22 September 1927; she was then laid up in the UK until 1931 when she was scrapped at Morecambe. When Donald indicated in the margin of the postcard “Its first trip to coast;” he clearly meant the picture was of the Orinta’s first trip to the coast, not his voyage, as his voyage is in 1906. In 1904, the South Atlantic route was Liverpool, La Pallice (La Rochelle), Corunna, Vigo, Lisbon, Recife, Salvador, Rio de Janeiro, Montevideo, Buenos Aires, Port Stanley (Falklands), Punta Arenas, Coronel, Talcahuano and Valparaiso. Where Donald has written they are anchored in the Straits, he is referring to the Strait of Magellan. His next stop was Chile's Punta Arenas which is located on the Strait of Magellan and was one of the most important supply stops for mariners of the day, until the Panama Canal opened for business in 1914. Gracie is not quite eleven at the time this postcard was sent by Donald Vigero, having been born on 5 December 1895 in Pueblo, Colorado. She is living at 422 Hickory St., Anaconda, Montana with her parents Edward Payson Mathewson and Alice (Barry) Mathewson. Grace is surrounded by her siblings, Mary her elder sister, her younger sisters Gertrude and Mary, and in 1908 the family adds a little brother, Edward. Grace not only liked to collect postcards, but she also became accustomed to traveling herself. In August of 1909, when Grace is thirteen she receives another postcard from Don while at the Arlington Hotel In Santa Barbara, California. The Arlington catered to the rich and famous of its time. Many of the postcards sent to Grace after August 1909 ask about “the fire.” August 15, 1909, while Grace was a guest, the Arlington Hotel burned to the ground in a fast moving fire killing several of the guests. One card postmarked four days after the fire writes how glad the sender was that Grace escaped. We can only imagine what a traumatic experience this must have been for her. Grace married Norman Church Streit (pronounced like fight) on 5 December 1917. They settled in Missoula with her father-in-law Lewis Streit while Norman sold farm equipment. Grace and Norman had three children Norman, Jr., Barbara and David. Young Norman was born in New York City 9 February 1919 while Grace was visiting her parents. Norman started his own insurance business and Norman, Jr. came to work for him after graduating from the University of Montana in 1941. In 1942, Norman, Jr. entered military service. He was a lieutenant with the 87th Mountain Infantry Division and first saw action against the Japanese in Kiska Island in the Aleutian Campaign. He was then sent to the European Theater as part of the 36th Infantry, 3rd Armored Division. His unit took part in the June 6, 1944 D Day invasion at Normandy, France. Lt. Streit was killed in action in Belgium during the Battle of the Bulge on Christmas Day, 1944. He is interred at the Henri-Chappelle U.S. Military Cemetery, Belgium. I could find no records to indicate that Grace and Norman were ever able to visit their son’s grave. Norman died in Missoula in December of 1959, Grace died thirty-four years later in Missoula, 27 September 1993, three years short of 100. Edward Payson Mathewson and Grace’s mother Alice, are not diplomats. E.P., as he is called, is the superintendent of the Washoe Smelter of The Anaconda Copper Mining Company in Anaconda, a position that provided a very comfortable income for his family of seven plus their two Irish maids Bessie and Nora. Born in Canada in 1864, Edward worked as a mining engineer in Colorado, Montana, Mexico, Canada, China and Chile. In 1926 he became a professor at the University of Arizona where he organized a new course in mine administration. E.P. was the President of the American Institute of Mining and Metallurgy. It was said that E.P. was Mr. Mining and Mr. Anaconda. E.P. lectured, wrote books and articles and owned a mining consulting firm in New York. 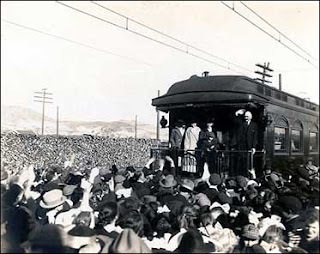 He worked with and for Herbert Hoover and showed President Taft around Anaconda when he visited. The family often accompanied E.P. on his travels. Grace had led a very privileged life. Grace, Alice, Alice and E.P. E.P. Mathewson was a pioneer photographer in Bolivia in 1901. Thirty-one ten-by-eight inch toned bromide prints from Bolivia, dated January 1901, are part of the Benjamin Stone Collection at the Birmingham Central Library in Birmingham, England. They are attributed to E.P. Mathewson of the Anaconda Copper Mining Company. The prints were obtained by Sir Benjamin Stone (1838-1914), a member of Parliament, world traveler, and photographer, in the early 1900s. Most of the views are of the mining camps at Huanchaca and Pulacayo (including women sorting ore, an amalgamation retort, plazas, llama herds, markets, street scenes, and policemen). A few are of streets and plazas in La Paz and Oruro. Note: I am continually amazed at the wealth of information found on the internet. I could have written a book on the information I found on E.P., Alice, Grace and her siblings. Not only from a simple postcard - from your deductive wizardry and your brilliant narrative. Was Donald a family friend I wonder - I almost thought he was a suitor, before you said that Grace was only 11 when she reeived that postcard. Wow! All from that little ol' postcard! Who knew we would have found something so rich with history! Fabulous story! That is truly amazing! I think you ought to become a biographer, because you are certainly doing a great job of unearthing the history of other families. You should seriously consider a book of such vignettes designed to show family historians the amount of material they can uncover and put together, looking beyond the names and dates so many researchers are fixated on. And, that's what Lorraine teaches us in Nearby History, too! When my husband was a youth, he discovered a box of old postcards left behing in a deserted Victorian house in Oakland, California. I will now go back and look at them with new eyes because of your post. What a surprise to see this blog! Grace was the second child of Edward and Alice Mathewson. Her sister Alice, the eldest, was my mother. Grace was Miss Personality of the family when eligible young men were invited to call. My dad, Edward V. Graybeal, another young mining engineer, came to call on one of these occasions and when he came into the room, my mother whispered to Grace, "This one's MINE!" Andy Graybeal, youngest child of Alice S. Graybeal. Incidentally, Grace's daugher Barbara and son Dave are still around. Barbara Koessler has a reunion every year at the Gordon Ranch-an impressive bunch. Dave was a captain on Continental Airlines for years and retired in the Denver area. Grandpa Mathewson left a whole shelf full of photo albums-pictures of mining and smelting operations in South America and Mexico taken in the early 20th century. I turned them over to the U of Arizona when we cleaned out our mother's garage. I have copies of the photos of more general interest. Grandpa was responsible for many improvements on the basic reverberatory furnace used in copper smelting. At the time he was GM of the Washoe Reduction Works, he could boast of the lowest cost per ton in the production of copper metal. We have an album full of post cards from trips as well. His last contract was in 1936-'37 for a smelter near to Hong Kong. He had colleagues in Japan dating from an earlier job in 1923 whom he visited on the way over. They advised him to discourage the Chinese from building the plant as war drums were indicating it would be captured by and used for the Japanese war machine. He convinced his clients of the veracity of this warning. Grandpa died in Tucson in July of 1948. What an amazing discovery! I wonder if her daughter Barbara Koessler overlooked the stash of postcards when cleaning out Grace's home on Brook Street. My name is Andy Graybeal and Grace was my mother's next younger sister. She lived in Missoula all her adult life and was, before she died at 97 the oldest living alumna of the U of Montana, having graduated in 1916. Edward Payson Mathewson, (Grandpa to me,) as you discovered was the general manager of the Washoe Reduction Works in Butte. The family lived in Anaconda. Alice Mathewson, (Grandma) had six children, Alice, Grace, Gertrude, Margaret (died in infancy) Mary Elizabeth and Edward Jr. They were originally from Montreal,and EPM, upon graduating from McGill University, sought employment as a metallurgist and started an illustrious career in that field at Pueblo (CO) Smelting Co. in the assay office. It was in Pueblo where Alice and Grace were born. E.P.Mathewson worked for the Amalgamated Copper Company, later the Anaconda Copper Co. for 14 years. He became general manager of what was then the largest smelter in the world and developed improvements on the reverberatory furnaces which could run 24/7 even during maintenance, leading to the lowest cost for extracting copper in the industry. He was also sympathetic to the plight of the workers and was at odds with the owners and their anti-union tactics. His departure from that job had much to do with his position. His profession took him and sometimes the entire family to such places as Chile, Peru, Mexico, Burma, Japan and China. He served as president of the American Institute of Mining & Metallurgical Engineers in 1923 while an independent consultant in New York City before retiring in Tucson, AZ as a professor of mining administration at the U. of Arizona. Thank you so much for all the wonderful information! I hope you won't mind if I do a post dedicated to your comments. I looked at your blog and I think it is wonderful. You must keep writing, there is so much you have to tell. Do you know anything about Grace and the fire at the hotel in Santa Barbara? I'd love to hear about that! I love your postcards and the way you retell a story, fM. You've inspired me to look in those antique stores for old pictures and postcards! As I grew into my 40s back in the late 60s, I began to resemble my grandpa, E.P.Mathewson, more and more, e.g. bald pate, mustache, and general appearance topped off with my stylish (think John Lennon) wire-rimmed glasses. With my bride and young daughter off visiting her family in Germany, the boys and I undertook a road trip to Montana, where we had an invite from my cousin Barbara to stay at her ranch not far from Missoula. Naturally, we hooked up at Aunt Grace's home on Brooks Street. This had been her home forever and looked pretty much like all the old pictures showed it when my siblings visited before WWII. It was late afternoon when we drove up. She opened the door and greeted us with hugs and kisses, then stepped back to take a better look. My resemblance to E.P.M. took her off guard and she started to cry. She took off my glasses and went into the kitchen to wash the road grime off them. Fully composed as she returned she said it was almost a shock, seeing Father standing in the doorway against the afternoon sun. What a beautiful story from postcards to people. I got goosebumps reading the post, and just as much when reading the comments. That's why we do what we do. And the story just keeps getting better. My name is David Mathewson Streit and Grace was my grandmother. Andy, you've provided alot of family history I didn't know about and I'd love to hear from you if you read this. (Google works). Readers may be interested to know that my parents, Dave and Helene (Kallgren) moved back to Montana just prior to his retiring from Continental. They built a big house in the Bitteroot Valley south of Missoula where they lived for several years. Dad continued to fly out of Hawaii and then worked for a startup feeder line based in Indianapolis as cheif pilot. They later moved into Missoula just a mile up the road from Aunt Barbara. They have had a busy retirement involved in civic groups, Camp Mak-A-Dream, Kappa Kappa Gamma sorority at the U and of course they are avid Grizzly athletic fans. Mom passed away three but Dad is still living in Missoula where he attends all the games, works with the Missoula Carousel Pony Keepers (he was one of the volunteer carvers that hand built that wonderful attraction)and gets in a little golf. Grace was an amazing woman and an inspiration to all of us that came after her. I guess you will eventually catch up with this string. It's nice to hear the Streits are still thriving in all that cold weather. I haven't seen your aunt Barbara since the 60's when the boys and I took a trip up to Missoula. That was also the last time I saw Aunt Grace whom I agree was a rock for your family. I'd be happy to fill you in on what family history I have, whcih might be TMI for you! I'm at andy.graybeal@gmail.com. Here it is, the day after Memorial Day, 2014 and reading the posts from several years ago, I still find this blog remarkable. I'm not sure if it is still active, it would be a shame for it to go dormant. You had mentioned that the Arlington Hotel in Santa Barbara burned down while the Mathewson family was there. I have several album pages of snapshots taken on a visit to the hotel and none show any fire damage. I would suggest they left prior to or before that calamity. In the past few years I've been in contact with my 2nd cousin in Ottawa (descended from EPM's brother Sam.) and have been learning about the Mathewsons in great detail. I had originally been in occasional contact with her father, who had amassed a list of over a thousand family members, however not digitally, which his son transcribed to digital form, making research much easier. EPM's brothers and sisters remained in Canada with the exception of one brother who retired with his wife in Pasadena, CA. Three of the brothers remained in Montreal and took over the family wholesale grocery business after their father retired. I have letters written by EPM back home in Perth Amboy, NJ while he was en route to Chile in 1899 and up to when they joined him in 1900. I've been attempting to transcribe them as they are full of interesting comments. At 81, I don't seem to be able to maintain my concentration as well as I'd like, though. While he was visiting the mines that were supplying the smelter he was in charge of in Antofagasta, he was present when the mummy of an indigenous miner was discovered. This mummy, preserved by the dry climate, altitude and minerals dated from around 900 AD, and was found with his tools, the victim of a cave in. The mummy after being carted around for display purposes is now in the Museum of Natural History in NY and a replica created by 3-D printing methods was made for a museum in Chile to show how far back mining history goes there. Andy, so glad to see you pop up here again with wonderful information. Still blogging and now also publishing a digital magazine. I'd be very interested in the en route to Chile letters to go along with the postcard from Chile. My email is footnotemaven@comcast.net. Would love to chat. Out of curiosity I did a search on the history of the Santa Barbara Arlington Hotel. The original hotel, which was built at the turn of the century, did indeed burn down in 1910 but was rebuilt in a style we now refer to as "Santa Barbara" with mission motifs. It was opened in 1911 and this is the one I have all the pictures of. I couldn't figure out where my mom and aunt Grace were, but this visit must have been around 1912, judging by the people in the pictures. Grace and Alice (Mom) were young ladies who desired an independent vacation and traveled to Colorado, Utah and possibly Arizona. EPM, (Grandpa) gave them each a $20 gold piece to spend as they wished. Alice purchased three Indian rugs, while Grace returned with her $20 gold piece in her purse. We still have those rugs and they would probably bring several thousand on today's market. Thanks Mom! I will have to go back and check, but there was correspondence regarding the fire. I wish I had purchased every single postcard. I could just kick myself.